I've been a little lazy lately and can't seem to concentrate. I seem to be painting what I'm thinking about. Cupcakes, to some of you, may not seem like work, and just because I love painting them and don't need to concentrate, doesn't mean I'm not working. Sounds like I'm making excuses for not putting my mind to work on a village scene to me. But believe me, it's hard to paint these and stay away from the kitchen. Now that's hard! I don't know about hard work, but it's hard to not go whip up a batch of these chocolate fudge cupcakes and eat myself silly! 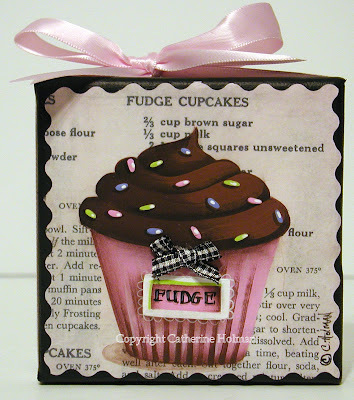 I added this little "Fudge Cupcake" painting to my eBay auctions this evening. A chocolate fudge cupcake with chocolate frosting is painted on top of a recipe from an old cookbook that is decoupaged to a canvas. Tiny colorful confetti in shades of pink, blue, and green are sprinkled on top of the fluffy frosting. 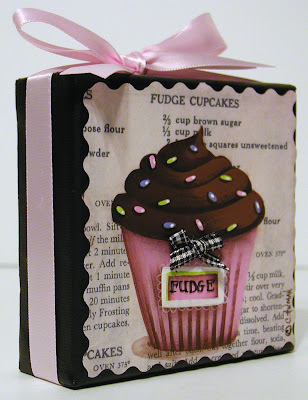 A pink cupcake liner and a "fudge" tag embellish this yummy cupcake. A tiny black and white checked ribbon is hot glued above the label. I've also attached a pink satin ribbon to the edge of the canvas and tied it in a bow at the top. The entire picture is painted except for the recipe and the ribbon. The recipe looks so good behind the cupcake. You are making me want to go bake too! Thanks for visiting my blog, I live in North Florida to answer your questions. It's going to be in the teens tonight and tomorrow night, so I have sheet and pots over some of the plants I would like to keep....may not make it though!! Yummy! It turned out beautifully! Just perfect! Perfect for this time of year too! So sweet! Can I just tell you how much I LOVE, LOVE, LOVE my little Valentine painting??? It's absolutely precious. Even cuter than the photo made it look! You are so good for my soul. This is so perfectly cute! I love the ribbon around it as well! What a clever idea painting on top of an old recipe! You are one clever lady! That is adorable Cathie! I love it but the Be Mine Valentine is my all time favorite of your cupcakes! You have such a wonderful talent. Now this is my kind of cupcake Catherine...I love chocolate!! This is really adorable too and I love the recipe that makes up the background. Adorable with the special touch of the pink ribbon. Classy. It looks good enough to eat, and so pretty too. Yes, they do look yummy. You're doing well to stay out of the kitchen after "baking" these paintings all day! I can see why it would be hard to focus with such a mouthwatering edible looking creation dripping off your paint brush! Have a creative and happy week!